Welcome to Cape May New Jersey…enjoy Restaurant Week and the Harbor Festival during the month of June. If you’re looking for information and reviews for your next trip to Cape May, you’ve come to the right place. At Cape May Resort.com we’ll give you the most current information from Yelp and real time local You Tube Videos to preview your next vacation or week-end trip Our site is totally dedicated to the Historic Cape May Resort vacation area. We have two goals – to promote our beautiful town’s local businesses and to assist potential visitors in finding anything they could want or need in and around Cape May NJ. This site is home to custom pages and video of easy to navigate information about Cape May Hotels from restaurant choices to weather reports to local Cape May events, we also host a local Cape May Blog featuring local events, things to do in Cape May NJ, shopping, golf, restaurants, whale watching, beach information, wine tasting and much more. Cape May Resort.com has been part of the South Jersey Cape May area since 1988. Let us put our local experience to work for you. Spring is in the Air at Cape May New Jersey, come down to the Jersey Shore for a Weekend Getaway and Relax. Cape May June Events, come down and enjoy Harbor Fest in June or enjoy Cape May’s best restaurants during Restaurant week. The First Day of Summer is June Friday June 21st the early Summer season in Cape May is in full swing during the month of June in Cape May, don’t forget to visit this month and experience the best events Cape May has to offer during the Month of June including Cape May Restaurant Week and the Cape May Harbor Fest. If you are looking for more things to do in Cape May this summer season please visit our June events page. Spend a day at the beach during the month of June, or go Dolphin and Whale Watching. Visit a local Cape May winery or check out the lighthouse and sunken ship at Cape May State Park. Cape May offers beach lovers Victorian architecture, fine dining, bird watching, boating and fishing in addition to world class resort and vacation accommodations. Cape May Restaurant week kicks off on June 2nd. June 2-9, 2013 will mark the 6th Cape May Restaurant Week, an eight-day culinary event featuring the area’s best restaurants. Three-course dinners, offered at $35 or $25 per person, will include an appetizer, entree, and dessert. Two-course lunches will be offered at $15 per person. Beverage, tax and gratuities are not included. Are you thinking of coming down the shore for a getaway or a romantic evening at a Cape May Luxury Hotel or Bed and Breakfast? Check the local listings and Cape May events as many local restaurants are offering specials along with discount codes for hotels for the special upcoming Memorial Day Holiday. May is the best time of the year to celebrate the Memorial Day Holiday with your significant other and make some special memories at the Jersey Shore this year. Check out our list for things to do during May in Cape May. Searching for a Vacation Package or Rental in Cape May NJ. Are you thinking of coming to Cape May this Summer Season for vacation and looking for that Cape May Resort Vacation Package? Cape May offers accommodations for every type of stay, including Luxury Cape May Resort, Historic Hotels, Motels on the Cape May Beach and Five Star Bed and Breakfast Inn’s. You can search below by type of Cape May Property be using the Cape May Resort menu bar to search for your Vacation package by type. Simply press on Historic Hotels, Luxury Hotels, Bed and Breakfast Inns or Hotels and Motels to see which properties are available for your upcoming Cape May Stay. It’s easy to plan a vacation in Cape May and discover the ideal accommodations for your upcoming Vacation. To Save Time and Energy you can use the Cape May information below to browse for a vacation stay down at the New Jersey Shore this summer. Save Money during your visit to Cape May NJ. Check our or local Money Saving Cape May Promo Codes, coupons and promotions to keep you saving Money. Nothing to clip totally paperless, simply show your local merchant your Cape May Coupon on your smart phone or tablet to receive the discounted offer. Cape May Water Sports Excursions, the Best Top Outdoor Excursions available during Vacation. Are you looking for an exciting day excursion in Cape May, the Wildwoods, Stone Harbor, Avalon or Sea Isle City NJ. Cape May Resort offers the best handpicked Water Sports and Outdoor Excursions daily packages. If you are planning a Visit to Cape May, we’ve put together the most popular local events in Cape May to enjoy during your Vacation. 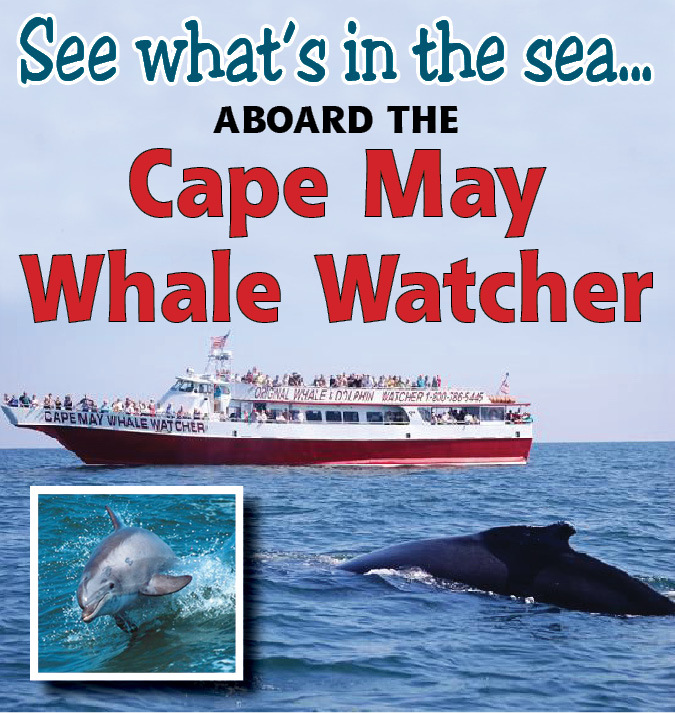 Daily adventure excursions from Cape May Whale Watching, to outdoor exhilarating outdoor water sports or a quiet kayak ride on the serene backwaters, we have the event package that your family wants to get the most enjoyment of your vacation time. If you are looking for that special event or outdoor excursions in Cape May, check out our event offerings today. Whether you are visiting Cape May for the first time or have lived here all your life, there are plenty of exciting or relaxing things to do in Cape May. Cape May Resort.com prides itself on having the best Water sports and Outdoor attractions. Working with the expertise of the local Captains, we have put together the five most action oriented Water Sports excursions in Cape May. Expect to get wet, get lifted up to 500 feet in the air, experience 180 degree turns or view dolphin schools or whales off shore. This is the only way to create your own personal unforgettable vacation memories in Cape May. Exhilarating Cape May Jet Boat Rides up to 35 MPH. New 46th Annual Jersey Cape Guide is Available for viewing on your Smart Phone or tablet for on the go use. It’s Summer time at the New Jersey Shore, are you getting ready to plan trip to the one of the beautiful Jersey Shore communities this season? The Cape May County of Tourism offers a complete guide on the Jersey Cape area. You can read about each of the Jersey Shore Communities in the guide and pre-plan your vacation to the Jersey Cape area. View the guide on line or download the PDF for on the go use as you head to your shore destination. 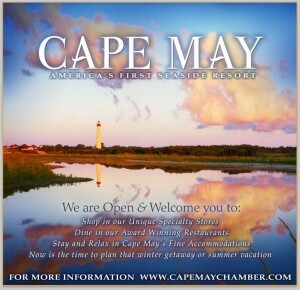 All images on this page are wholly owned or licensed by CapeMayResorts LLC. Any reproduction or duplication of proprietary images on another website or in print without prior express written consent from CapeMayResorts LLC is prohibited by law. Content copyright 2012 CapeMayResort.com LLC . This entry was posted in Cape May Resort Blog on June 10, 2013 by Ryan Reclaim.